A page from the new website for the Slooh Community Observatory. Slooh encourages community members to look up into the sky and share live space views with the re-launch of the observatory's official website, Slooh.com. The Slooh Community Observatory has revamped its website to better engage both experienced and beginner astronomers in the exploration of space through the organization's robotic telescopes in the Canary Islands and Chile. 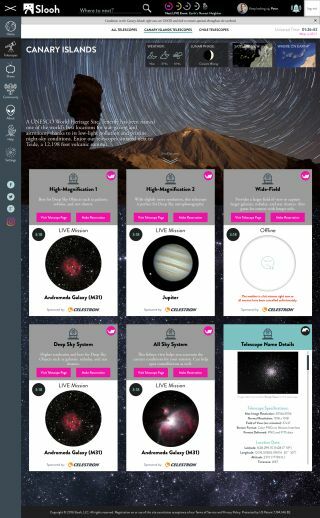 The re-launch of Slooh.com brings engaging new features, including a "Community Perspectives" page and a dashboard to reserve observing time (called missions) and capture telescope images. Since 2003, Slooh community members have operated the observatory's robotic telescopes for 4,800 consecutive nights (observations are weather permitting), collecting over 5 million images of unique objects in the sky, according to Slooh. Slooh's membership levels include a free 30-day trial period, an entry-level Slooh Apprentice at $4.95 per month and a more advanced Slooh Astronomer membership for $24.95 a month that gives subscribers the chance to point telescopes at any night sky object. When members schedule a mission, they can watch the live feed from the telescope online and capture images of what the telescope sees, Paolucci said. Images from any mission that a member joins are saved to that member's account, to view online or download, regardless of whether the member watched the mission live or not. Other members are thus able to "piggyback," or join, a reserved mission, allowing members to share the experience, Paolucci said. A page from the new website for the Slooh Community Observatory shows a list of live "missions," meaning what the telescope is currently studying. The live feeds from all of Slooh's telescopes and the organization's partner observatories are streamed to Slooh's Situation Room, where a team weaves together the various the feeds during live webcasts and other skywatching events hosted by Slooh, he said. Some members also have permissions to open and close the domes that house the telescopes when sandstorms or severe weather move in, making the system entirely community-operated, Paolucci told Space.com. The new website offers an enhanced user experience that makes it even easier to use Slooh telescopes; all you need is an internet connection. Members can make reservations online up to a week in advance to point a Slooh telescope at any spot in the sky that is above the horizon and in the telescope's field of view, Paolucci said. .
"It's always been about gathering people around these live [telescope] feeds," he said. "We liken it to a jukebox: One person puts the quarter in, but everyone else is listening. They all get to watch, take photos and interact while the telescope is moving throughout the night." Slooh community members can also submit content to accompany skywatching events. Slooh welcomes diverse posts, including topics in science, art and culture, the human spirit, and DIY. All posts are available to the public, inviting everyone to participate in the experience. "The new website is going to give people the ability to interact more with other members of the Slooh community," Tricia Ennis, show lead at Slooh, told Space.com. "There is often a barrier for brand-new people or users that don't have a science background, but the new website has a focus on those people. Space is huge and can be terrifying, but we try to bring it to as many people as possible with any kind of entry point that they want, whether it be art, history, science or photography." Slooh offers different membership tiers, with varying access permissions and fees. More information about joining Slooh can be found here.